It’s a replay of 2017’s Western Conference Semifinal this weekend when Republic FC take on Swope Park Rangers at Papa Murphy’s Park in the first round of the USL Playoffs, presented by UC Davis Health. Kickoff is 7:30 p.m. Ahead of Saturday’s match, see how the Swope Park Rangers enter the match. Swope Park kicked off their 2018 season with a goal fest, taking a 4-3 win against Reno 1868 FC in their season opener. The Rangers held steady in the first half of the season, going on a five-match undefeated streak from April 4 through May 5. Republic FC first faced the Rangers in 2018 on July 10 at Children’s Mercy Park. It was a record-breaking night as Cameron Iwasa smashed the club’s all-time USL goals record with his first of two goals that night. Christian Eissele completed the 3-1 win for the Indomitable Club. After that loss to Sacramento, Swope Park went on their worse run of the season, going eight matches without a win between July 10 and August 19. Their worse loss of the season came during that period – a 4-0 loss against Orange County SC. Despite the rocky middle to their season, the Rangers stayed in the hunt for playoffs. Swope Park wouldn’t clinch their spot in the postseason, however, until their very last match of the season. With the seventh seed within in reach with a win, Swope Park went into attack mode against LA Galaxy II. The Rangers put five goals past Los Dos to claim the 5-1 win and a spot in the 2018 USL Playoffs. Hadji Barry has been the main man up top for the Rangers. Barry scored Swope Park’s lone goal against the Indomitable Club back on July 10 when Republic FC took the 3-1 win. He made USL history when he scored goals in eight straight games. Barry leads the Rangers in minutes with 2,774 minutes played. He also leads in goals, scoring 17 in 33 appearances, and recording five assists – tied for first place in the club. Tyler Blackwood could likely be lining up against his former club once again, this time with a spot in the Western Conference Semifinals on the line. The last time Swope and Republic FC faced off, Blackwood nabbed the only goal for the Rangers. Blackwood had seven goals and three assists in 32 appearances for the Rangers during the 2018 regular season. Last season, the Rangers handed Republic FC their exit from the 2017 USL Playoffs. After taking down the number one seed in the Quarterfinals of the Western Conference, Republic FC traveled to Children’s Mercy Park for the Semifinal bout against the 2016, and eventual 2017, Western Conference winners. The Rangers found the first and only goal of the match in the 46th minute through forward Kharlton Beltmar, after Belmar hit the mark on a rebound. Republic FC had their best chance in the 71st minute when a deflected pass went back to Villyan Bijev. Bijev hit the ball on the volley, but his shot went just wide of the post, and Swope took the victory and the spot in the Western Conference Final. The boys in red took an important win against Swope Park Rangers in their last encounter on October 3. 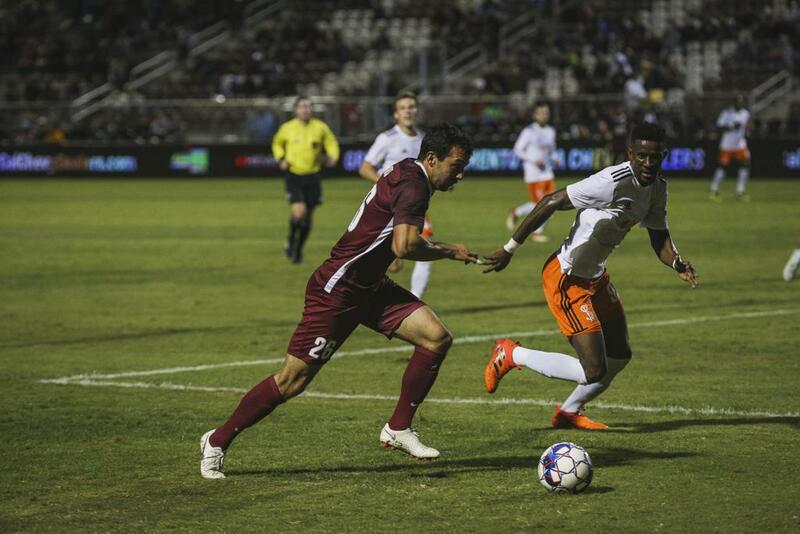 The win kept Republic FC in the fight for the Western Conference’s second seed. Bijev opened the scoreline in the 17th minute off a pass from Cameron Iwasa. The Rangers came back into it through a tap-in goal from Blackwood. Iwasa would go on to score his third goal against Swope Park this season in the 57th minute, heading home a perfectly placed cross by Luis Espino. Jure Matjasic came on as a substitute for Christian Eissele in the second half and sealed the win for Republic FC with the club's third strike of the night. Elliott Hord whipped in a bouncing cross into the box for the Slovenian to tap home on his first touch. Republic FC and Swope Park Rangers will face off on Saturday at Papa Murphy's Park in round one of the USL Playoffs, presented by UC Davis Health.